Dynamic Investment Theory (DIT) sets the logic and methods for creating an unlimited number of Dynamic Investment products. You can read about Dynamic Investments on this site. Each individual DI has the components shown at right that make them fully diversified, market-sensitive and capable of producing returns that static MPT portfolios can't touch. A single DI can be the ONLY investment in a portfolio. But DIs can be also be combined in Dynamic Portfolios to meet a wide variety of investment goals. The purpose of this Web page is to provide a quick overview of how DIT and DIs opens a vast, virgin world of new product development. New DIs are created by changing variables within the DI structure as shown in the nearby diagram. The variable that designers will concentrate on the most is the content of the Dynamic ETF Pool that holds ETF "candidates" for purchase. Let's look at just a small sampling of the variety of Dynamic Products made possible by the introduction of Dynamic Investment Theory. A single Dynamic Investment can be the ONLY investment you hold. It is fully company-diversified by the use of ETFs and it is asset-diversified by holding ETFs for multiple assets in its Dynamic ETF Pool (DEP).. But it also is time-diversified by having the internal intelligence to change the one ETF from the DEP that holds at a time. This is the ETF that is trending up most strongly at the time of a Review. Refer to the diagram above for how this works. You can see on this page the superior performance of just holding the NAOI Primary DI over holding a traditional MPT portfolio for the decade from 2008 to 2017. The Primary DI simply holds stock and bond ETFs in its DEP and rotates between them based on the price trends of each. But the NAOI knows that allocating 100% of your investing money to one ETF at a time can be too much of a "culture" shock for most investors. Most of our NAOI students prefer to include DIs in a more traditional portfolio structure. So for our purposes here, lets view DIs as portfolio building blocks and explore the incredible portfolio products that can be built. Multi-Asset DIs. This type of DI contains ETFs in its Dynamic ETF Pool (DEP) for different asset classes. Thus, it rotates between or among owning the major assets based on which is trending up most strongly as the time of a Review. The asset classes used will be mainly Stocks and Bonds but could also include Real Estate, Commodities, Emerging Markets, etc.The following diagram shows at left a sample DEP for this DI type and then, at right, a performance comparison between a traditional MPT portfolio with the allocations shown and an example Multi-Asset Class DI. Asset Focused DIs. This type of DI holds ETFs in its DEP that are primarily focused on one asset class - Stocks in this example. In today's MPT-based world a portfolio designer who wants to add to the portfolio exposure to stocks, they must then decide which types of stocks to include. There are many choices such as large-cap, medium-cap, small-cap and then growth or value for each market cap. Most designers simply include a Total Stock Market ETF or mutual fund and move on. By doing so they can leave a lot of positive returns on the table as different stock types can perform much better than the total stock market. The problem is solved using a Dynamic Stock Investment. This DI contains ETFs for multiple stock types in its DEP. Then, during a Review event, the ETFs in the DEP are ranked and only the one ETF that is trending up most strongly is bought and held until the next Review when the DEP is ranked again. Thus, the MARKET selects the type of stock to own and by being able to switch between stock types enables this DI to produce significantly higher returns than a Total Stock Market ETF. Also note that the DI has an "Escape Valve" ETF that is a Bond ETF. This is purchased if the entire stock market is trending down, in which case history tells us that Bonds should be trending up. The diagram below shows the astounding difference in performance provided by the Dynamic Investment. Market Focused DIs. The type of DI is used when a portfolio designer or investor wants exposure to a specific area of the market for example the Internet. These types of investments can be very risky in an MPT portfolio where they are bought and held for the long-term. This problem is solved by including an Internet Focused DI that contains the ETFs shown in the DEP below. Here the Internet ETF will only be purchased and held for one period if it is trending up in price more strongly than either Stocks or Bonds. In the below example the Internet ETF, PNQI, was held for about one third of the time during the backtest period. All other times it held either a Stock or a Bond ETF. You can see from the performance table that the Dynamic Internet DI was far more profitable and less risky than simply buying and holding the Internet ETF, PNQI. Mixed Focus DIs. The final DI type that I will discuss is one having a DEP that holds ETFs for at least two assets class - for example Stocks and Bonds. And for at least one of these asset classes it holds ETFs for multiple "types" of the asset - as an example, for the Stock asset class it may hold an ETF for Large-Cap Value Stocks and an ETF for Small-Cap Growth Stocks. For the Bond asset class it may hold two Bond types such as Long-Term Government Bonds and Junk Bonds. 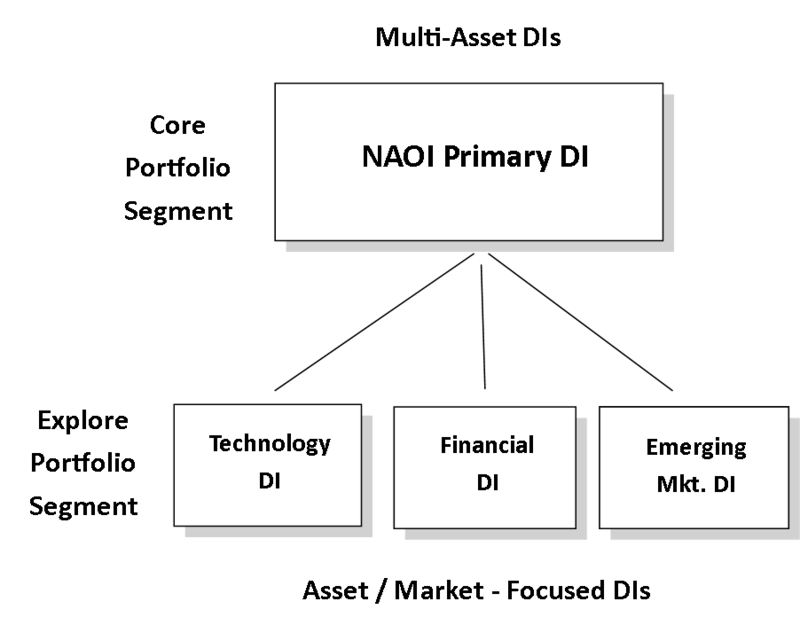 The NAOI Primary DI is an example of a Mixed Focus DI having the following DEP and Performance Data. These are four types of DI building block "types" that portfolios designers can choose from when designing a portfolios. Each is a standardized product that can be purchased from a DI Designer Catalog. Or portfolio designers can create their own. Just look at the returns produced by each of them. Imagine the power of combining these DIs in a portfolio and adding yet another degree of diversity that will lower the already low risk of each of these building blocks even more! These are Standard Consumer Products! The DIs discussed just above and any other DI created are consumer products that can be purchased from catalogs like the one illustrated below. They are NOT customized for any investor's risk tolerance. And they can simply be bought and held for the long-term. The DI design does not change but the ETF it holds does. DI products such as these can be created and sold by a variety of vendors and this introduces the cleansing effects of competition into the investing marketplace. Only the "best" DI designs will survive. Another advantage of DIs being investment "products" is that each has a performance history that can be displayed in the catalog as shown below enabling buyers to make informed choices. This "Productization of Investing" is a massively leap forward in the world of investing. Its implications are discussed in detail in Chapter 8 of The Amazing Future of Investing that can be purchased in the NAOI Store. Investors can purchase DI products and use them as portfolio building blocks in configurations as discussed next. We now have an array of powerful DI Building Blocks with which to build even more powerful Dynamic Portfolios. And they can be used in the same structure as MPT portfolios used today - namely in a Core and Explore configuration as shown below. But this is a new world. Instead of the Core consisting of total stock market and total bond market static mutual funds or ETF, in the DIT-world of investing it consist of one Multi-Asset or Mixed Focus Dynamic Investment. You have learned just above that these DIs will own either Stock or Bond ETFs depending on market trends. And just look at the returns of these DI types also shown above. In the Explore Segment a designer will place Asset-Focused or Market Focused DIs as shown in the diagram below. These will be far more powerful portfolio components than the stand-alone static funds or ETFs used today. They also will change their holding based on market trends. Note that in the design of Dynamic Portfolios is where customization comes into play. In the MPT world, customization happens up front in order to match the risk tolerance of each investor. In the DIT world, each DI building block has already reduced risk to a minimum so by being asset, company and time diversified. Dynamic Portfolios don't need to be customized to match any risk profile. Customization in this new world consists of deciding in which areas of the market the portfolio should search for higher returns via the inclusion of Market and Asset Focused DIs in the Explore Segment! The NAOI is aware that change of the nature discussed here will not come overnight to the world of investing. DIT methods and Dynamic Investments will take some time getting used to. Thus, we have created what we call an MPT/DIT Hybrid portfolio configuration that allows for the easy and non-disruptive transition from DIT to MPT. A Hybrid portfolio consists of one part MPT portfolio and one part Dynamic Investment as illustrated below. An NAOI MPT/DIT Hybrid Portfolio can also serve as a transition vehicle, enabling advisors and/or investors to easily transform their portfolio from today's MPT design to the DIT design of the future. The table below illustrates how this transition can be done by changing the portfolios allocation to each component of the Hybrid Portfolio. 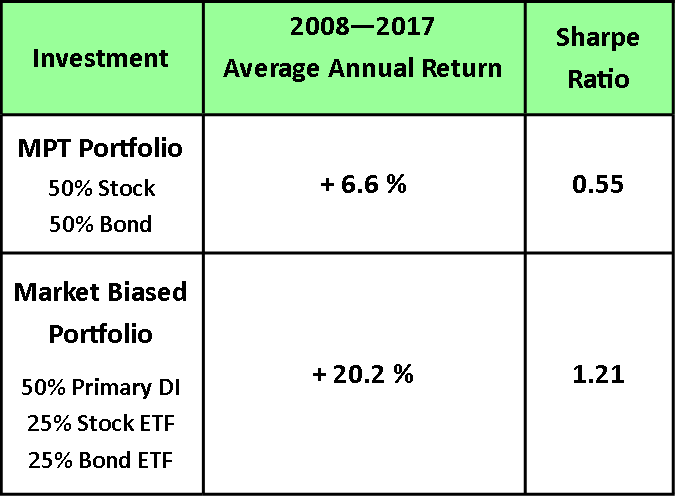 You can see how increasing the allocation of money to the Dynamic Investment also increases returns without increased risk, as the Sharpe Ratio goes up with the returns. The table row shaded in green is a good starting point for this transition. As investors become familiar with how to manage the DI and sees its superior performance they can then gradually increase the allocation to it and in this manner gradually transform the portfolio to one that is mostly, or entirely, a Dynamic Portfolio. Chapter 10 of the Amazing Future of Investing book shows a Case Study of how an NAOI student used a transition Hybrid Portfolio to obtain the returns she needed from her portfolio to meet her investing goals. Chapters 7 and 9 of The Amazing Future of Investing discuss and illustrate an exciting new portfolio design concept that the NAOI calls a Market-Biased Portfolio. This powerful portfolio type holds two standalone ETFs with equal allocations to each e.g. 25% allocation to a Stock ETF and 25% allocation to a Bond ETF. These ETFs and their allocations do not change. But also in the portfolio is the NAOI Basic Dynamic Investment that rotates between a Stock and Bond ETF based on market trends. On this page I have discussed several "types" of Dynamic Investments that can be designed and how they can be combined in a variety of configurations to create powerful Dynamic Portfolios. I hope you have seen the major difference between the way portfolios are designed today using MPT methods and how they will be designed in the DIT-future of investing. Using MPT methods a designer must select individual investments such as mutual funds and/or ETFs to place in a buy and hold portfolio and then just hope for the best. Using DIT methods a designer selects from among a wide variety of Dynamic Investment building blocks, each holding groups of ETFs. These DIs then select the one ETF to own on a periodic basis based on the one that is trending up the most strongly. By combining these DI products designers are able to create market-sensitive portfolios that are capable of buying only into market uptrends while avoiding downtrends. These are dynamic and intelligent portfolios. MPT produces static and "dumb" portfolios. And you have seen on this page, and others of this site, that the performance of Dynamic Portfolios far exceeds that of the MPT portfolios that are the industry standard today. A Vast New Field of Investment Research! 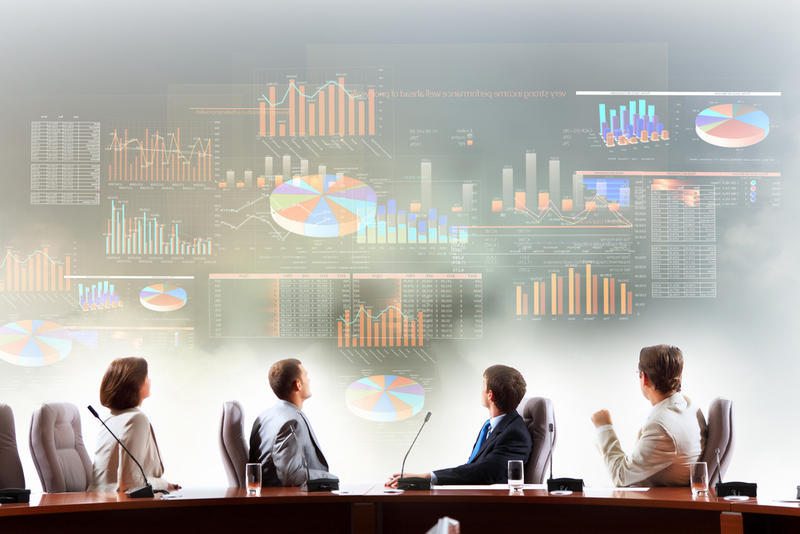 DIT opens a vast and virgin field of investment design research. Those who first understand DIT and the products it is capable of producing will have the potential to profit handsomely. A good start to realizing this potential is reading The Amazing Future of Investing book found in the NAOI store. And then for financial organizations to mine the gold to be found in DIT development an NAOI Consulting Contract should be considered. Financial Organization who want to take full advantage of new dynamic investment development opportunities and potential should seriously consider an NAOI Training Class and/or a Consulting Contract. Doing so will give your organization a massive competitive advantage now and a lead role in defining the future of investing. More information on NAOI support resources if found by clicking here.